The term “stoner food” might seem ambiguous (after all, isn’t all food technically stoner food? ), but Giorgio Rapicavoli has elevated this particular style of cuisine to an art form unto itself. Depending on your thoughts on prenatal learning, you could make the argument that Giorgio’s culinary education started before he was even born; after all, while his mother was pregnant with him, she would watch hours upon hours of cooking shows. And after Giorgio was born, his two can’t-miss programs were “Sesame Street” and Julia Child’s shows. At the age of 14, Giorgio convinced the manager of the restaurant where he worked as a busboy to let him work in the kitchen while still paying him busboy wages. His education continued with a short stint at Johnson & Wales’ culinary school, then in the Coral Gables, Florida restaurant scene. In 2012, Giorgio appeared on “Chopped” and, to nobody’s surprise, won the $10,000 prize. Giorgio rejected a New York Chef’s offer to move up north and work in his kitchen, choosing instead to use the prize money to start his first restaurant, Eating House. Now, as the head chef and co-owner of Eating House and the now-closed Taperia Raca, Giorgio is working hard to fulfill his vision of taking the Miami culinary scene to new levels, starting with the aforementioned stoner food (for example, Tang mimosas and Captain Crunch pancakes with milk syrup). Giorgio wholeheartedly rejects the notion that the preparation and presentation are the most important elements of his dishes; as he puts it, “You don’t need to know about all of the process.” Instead, Giorgio chooses to focus on the finished product and making it as delicious as it is unexpected. At Eating House, offerings include marinated olives with orange peel, garlic, and California olive ranch olive oil; heirloom tomatoes with thai fish sauce, peanut, ginger, and frozen coconut milk; stracciatella with Jerusalem artichoke, toasted hazelnut, mint and sherry; grilled broccoli stems with broccoli floret salsa verde, roasted lime and cotija; oyster mushrooms with salsa anticuchera, chive oil, aji panca and onion brine; tiradito with mango leche de tigre, raw Calabaza, jalapeno and lime; fried free range chicken with buttermilk waffles, maple, candied bacon and hot sauce; pasta carbonara with black truffle, Applewood bacon, egg yolk and grana Padano; green rice with green vegetables, soft egg, smoked yogurt and kale chip; halibut with brown butter-miso, creamed corn and corn cob dashi; 420-minute braised short ribs with roasted sunchokes, charred onion and caramelized squash; and duck breast with grilled Treviso, red grape salad and pistachio praline. With so many chefs battling for awards, acclaim, and public recognition, it can be tempting for a chef to model their dishes after those of someone else who has already achieved success. ButJustin Yu has a different approach: “It’s the little details that make a dish yours, and special.” Justin has implemented this approach to great success, and even though he’s in the land of steakhouses, chili cook-offs and all-you-can-eat barbecue, his vegetable-centric approach to cooking has set him apart from his peers. After working in some of the country’s most critically-acclaimed restaurants like Houston’s *17, Chicago’s Green Zebra and Spring, and Ubuntu in Napa, Justin took his talents abroad, staging at In de Wulf in Belgium and Copenhagen staples AOC and Geranium. Drawing upon his years of experience and considerable talents in the kitchen, Justin returned to Houston and opened Oxheart with his partner Karen Man; Oxheart has since become one of Houston’s most widely-lauded restaurants, and Justin has gained a fair level of fame in Houston for bucking the trend of nose-to-tail meat dishes, focusing instead on the flora of his hometown and its regional offerings. Known for his “garden prix fixe” menu, Justin has used Oxheart as a platform to bring his vegetable-based offerings to the masses, and Justin is best known for his signature dish, a stew consisting of Queen Anne peas, fermented brassicas with Texas rice, mushrooms and caramelized sauerkraut. At Oxheart, the menu includes chilled Golden Delicious apple broth and roselle with cranberry hibiscus and oyster mushrooms; mung bean pancake with alliums, potato and miso with pickled beets and burnt onion; porridge with grains and Texas winter wheat cooked in vadouvan spices with cauliflower, cilantro and Navel orange; slow-roasted cured mirepoix with vinegar and horseradish; crème fraiche cremeux with strawberries glazed in mushroom and sorghum with thyme and lime, and “Appalachian Greasy” beans with tomato, dried tomato and flowering herbs. Oxheart does offer some options for those of us who simply can’t do without meat. Offerings include “Onaga” snapper a scapece with raw squash, basil-seaweed broth and preserved fruit and guinea hen stuffed with rice and collard greens, served with a preserved shellfish sauce. When you think of the prime “foodie” locations, Dallas very rarely comes to mind. But John Tesar is working to change that, and if his past success is any indication, it won’t be long before it’s mentioned in the same breath as New York, San Francisco and Paris. As a three-time semifinalist for the James Beard Foundation award for “Best Chef: Southwest” and “Top Chef” contestant, John has long been considered one of the best chefs in the industry, and his restaurants have received “Best New Restaurant” nods from Esquire magazine and critical acclaim from Food & Wine magazine, New York magazine and The New York times. John started his career working with Anthony Bourdain at the Supper Club in New York before heading out west to work with Rick Moonen at rm Seafood in Las Vegas. In 2007, John moved to Dallas to run the kitchen at The Rosewood Mansion on Turtle Creek, where he earned two five-star reviews. In 2012, John opened Spoon Bar & Kitchen, earning critical acclaim; two years later, John opened Knife in the Highland Dallas Hotel. As a consultant, John has also found success, first at the Dallas Chop House, then at the Dallas Fish Market, Wild Salsa and Chop House Burger. At Spoon Bar & Kitchen, John explored the world of seafood cuisine, and his dishes included cuttlefish with jalapeno oil, yuzu & pink peppercorns; yellowtail with Texas ruby red grapefruit, ligurian olive oil & shiso; diver scallops with ceviche & dried sweet corn; celery soup with curried gulf crab; live diver scallops with brown butter, dashi & perigord truffle; smoked sturgeon headcheese with horseradish cream & sturgeon caviar; and fluke sashimi with blood orange, fennel & nasturtium flowers. At Knife, John aims to reinvent the concept of a contemporary American steakhouse, and based on the reviews he’s received thus far, it’s clear that his mission is a success. Menu items include bigeye tuna tartare with green onion, sriracha, cucumber, sea salt & wasabi tobiko; beef tartare with oysters & fried egg; crispy pork belly with collard greens; sriracha pork belly with hoisin sauce, sriracha & Corsicana pickles; rack of lamb with mustard, garlic & herb crust; long bone pork chop with apple sauce & collard greens; English pea & rock shrimp risotto; oxtail ravioli with parmesan monte and aged balsamic; penne & black truffle essence, and fettuccine Bolognese. Japanese fusion is normally a style of cuisine reserved for Japanese-born chefs, but Tyson Cole has made quite a name for himself working in this style. Tyson began his career as a dishwasher at a Japanese restaurant in Austin, TX, and when some of the sushi chefs departed, Tyson got a shot at making sushi. Needless to say, he didn’t squander the opportunity. In 1996, Tyson began his apprenticeship under Takehiko Fuse, the owner and head chef at Musashino Sushi Dokoro in Austin, and not only did he learn the finer points of making sushi, he also learned Japanese. After moving to New York City, Tyson worked at the sushi restaurant Bond Street, where he further honed his craft. Not forgetting his roots, Tyson returned to Austin in 2003 to open Uchi, his first sushi restaurant. 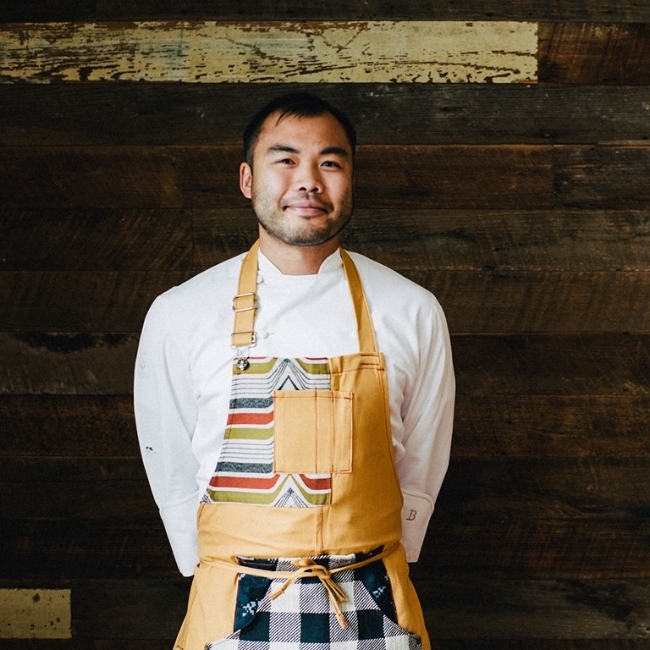 Seven years later, Tyson opened Uchiko (loosely meaning “offspring of Uchi”), and based on the success of his flagship restaurant, Tyson expanded his empire to Houston in 2012 and Dallas in 2015. Tyson was named Food & Wine magazine’s “Best New Chef” in 2005, one of the “Top 6 Texas Tastemakers” by Saveur in 2009, and was nominated by the James Beard Foundation for the “Best Chef: Southwest” award in 2008, 2009, and 2010. Finally, in 2011, Tyson took home the award. Tyson also took his talents to the small screen, competing against Masaharu Morimoto on “Iron Chef America” in 2008.
uzura yaki :: quail. spiced carrot. madiera jus. Tyson’s focus is entirely on creating inventive sushi dishes that honor the craft of sushi making while adding his own flair and the local ingredients available to him to the menu. Offerings at Uchi include thinly-sliced flounder sashimi, candied quinoa and olive oil; smoked yellowtail, yucca crisp, marcona almonds, Asian pear and garlic brittle; yellowtail, ponzu, thai chili and orange supreme; bigeye tuna, watermelon and nam pla; ocean trout, cantaloupe and country ham; wagyu beef, ponzu diver scallop and sanbaizu; coconut-marinated young chicken, nuoc mam and jasmine rice; pork belly, radish, citrus, and thai basil; short rib, lemon and onion; seasonal mushroom, koshihikari rice, and Korean chili; oak-grilled escolar, candied citrus, yuzupon and myoga; and fried marinated chicken and seasonal pickle. At Uchiko, Tyson offers a more daring variation on the Uchi sushi menu. Items include yuzu kosho, nuoc mam and green papaya; atlantic salmon, dinosaur kale, Asian pear and yuzu; sea bass, radish, stone fruit and dill; lion’s head peppers and “uchiracha” (Tyson’s take on Sriracha); brussels sprouts, fish caramel, lemon and chili; fried marinated chicken, cucumber and seasonal pickle; duroc pork belly, allium and fennel; maitake, white ten tsu yu broth and tofu; duck leg confit, pickled fruit, endive and liquid smoke; and Mediterranean sea bass, tomato, mint and chili. Though celebrity chefs are a dime a dozen nowadays, Emeril Lagasse was the first to parlay his celebrity status into an empire. Emeril’s 18 best-selling cookbooks, 14 restaurants, line of branded products (including food products like pasta sauces, marinades, salsas and spices, two lines of kitchen knives, a cookware line, and kitchen appliances) demonstrate that not only is Emeril an incredible chef in his own right, he’s also a very savvy businessman. His inclusion on this list should come as no surprise to anyone who’s followed his meteoric rise to stardom since he started his career in 1985. In 1985, Emeril took over for Paul Prudhomme (another legendary chef) as the executive chef at Commander’s Palace in New Orleans, and during his seven-year tenure, he gained fame and notoriety. His first restaurant, Emeril’s in New Orleans, was named “Restaurant of the Year” by Esquire magazine in 1990, and since 1999, Emeril’s has won the Wine Spectator magazine “Grand Award.” Emeril himself has won “Best Chef: Southeast” by the James Beard Foundation in 1991, “Chef of the Year” by GQ magazine in 1998, “Executive of the Year” by Restaurants & Institutions magazine in 2004, the 2005 Wine Spectator magazine “Distinguished Service Award,” a Lifetime Achievement Award from Food Network, “Humanitarian of the Year” by the James Beard Foundation in 2013, and has been inducted into the Culinary Hall of Fame and the Taste Hall of Fame. The son of a French-Canadian father and a Portuguese mother, Emeril has drawn upon the cultural culinary influences of his parents during his career. Emeril’s cooking style is a blend of Cajun, Portuguese, Creole and French influences, and his background shows through in the menus at his restaurants. At Emeril’s in New Orleans, you can find evidence of these influences in the menu items. Offerings include house-made andouille and boudin sausages with braised collard greens, turbodog onions, whole grain mustard and Worcestershire sauce; cast-iron baked escargots with fresh angel hair, bagna cauda-parsley butter, bottarga, pancetta and parmesan; steamed mussels with sweet corn, oven-dried tomatoes and pancetta crumbs; grilled salmon with buttered farro, tomato-okra-corn stew, and smoked ham hock; char-grilled hanger steak with tahini potatoes, smoked sweet onion, fresh horseradish, and green tomato seed-roasted chili oil; jerk head-on shrimp with saffron broken rice and peas, charred cabbage & peas, and peach-pepper preserves; barbecued shrimp with petite rosemary biscuit and chives; lacquered duck fried rice with duck egg, local greens and peach-mustard duck sauce; and andouille-crusted drum with grilled vegetables, shoestring potatoes, glazed pecans and creole meuniere. Like many chefs on this list, Jamie DeRosa was introduced to the world of cooking at a very young age. In fact, Jamie recalls making his very first paella at the age of 7 (with his grandmother’s assistance, of course). 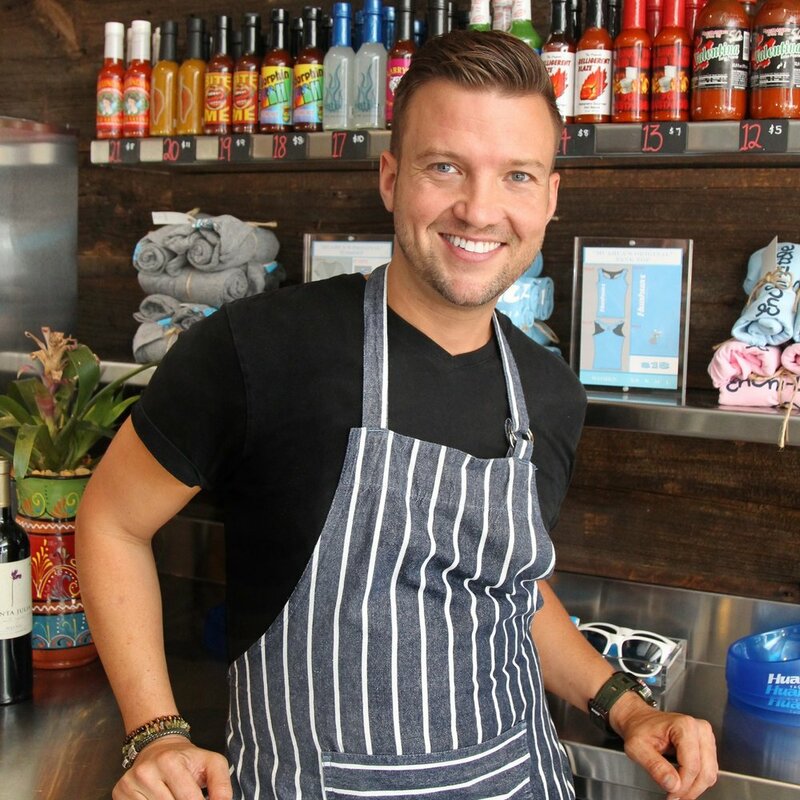 After attending culinary school at Johnson & Wales University in Miami, Jamie worked with legendary chefs like Allen Susser and Wolfgang Puck, and Mark Peel. It was at Peel’s famous restaurant Campanile that Jamie perfected the style that has served him so well over the years: a blend of modern cooking styles with European culinary techniques. The result was one of the earliest “farm-to-table” restaurants in the United States, and it brought Jamie to Patina restaurant as the executive chef. After a tour of China to hone his skills in international cuisine, Jamie opened Taste Gastropub in 2009 with Susser. Taste, known for its blend of fine dining and a convivial pub atmosphere, was an immediate success, and following up on that, Jamie opened Izzy’s Fish & Oyster in Miami in September 2015. Izzy’s has been a rousing success, and its New England-themed take on seafood is a welcome departure from the norm for Florida diners. Many chefs strive to evoke feelings in their dishes, but there are very few who evoke the feeling of being in a seaside New England town as masterfully as Jamie. At Izzy’s, his main focus is naturally on the bounty of the ocean, and the menu at Izzy’s showcases Jamie’s vast array of culinary skills gleaned from his years of traveling and training under legendary chefs. The menu at Izzy’s demonstrates the many ways in which Jamie is able to approach his dishes. Offerings include sugar snap pea salad with grana Padano cheese, mint and marcona almonds; stuffed clams with linguica and Old Bay butter; Maryland blue crab cake with vegetable cole slaw and Florida arugula; lobster poutine with waffle fries, cave-aged cheddar and smoked bacon; linguine with blistered tomato, sherry butter and orange; and the local catch of the day with fennel & citrus salad and salsa verde. Though Jamie’s focus is currently on the bounty of the sea, it’s clear that with his training and the extensive travel he has done, he is capable of creating a variety of dishes in a multitude of styles. Tandy Wilson’s culinary philosophy can best be summed up in his own words: “It’s all about delicious food that provides the sustenance to keep the family going. I’m talking about the glue that holds hard working families together, smart, local, nourishing and above all, delicious.” Tandy approaches the culinary arts with the same no-frills mindset found most often in traditional Italian cuisine, so it should come as no surprise that that’s where he learned the finer points of the art of cooking, first at Nate Appleman’s Tra Vigne in Napa Valley, then in Italy. Tandy’s Nashville restaurant City House combines the rustic Italian approach with a contemporary twist, and its success helped earn him the James Beard Foundation award for “Best Chef: Southeast” this year. Opened in late 2007, City House has consistently been considered one of the best restaurants in Nashville, and it’s easy to see why. You likely won’t find Tandy on any celebrity chef shows anytime soon, but given his low-key approach to cooking and his focus on simply creating the best meal possible, we’re sure to keep hearing his name for a long time. Tandy’s simple approach to his cooking enables him to create traditional dishes with flair, and it’s an ethos that extends all the way to the types of ingredients he orders. Tandy has a long-standing limit of five imported ingredients in his kitchen at one time, which challenges him to make the most of local ingredients and build high-quality dishes using only his innovation and the resources available to him. To some chefs, this approach would seem like madness- it’s hard to imagine Michael Mina limiting himself to only a handful of imported ingredients. But to Tandy, it helps him achieve the fine balance between simple and savory, and the menu at City House reflects that balance. The menu consists largely of pizza and appetizers. The appetizers include scrapple with cucumber, garlic & chili ferment, mint and lemon; octopus with za’atar, sweet potato and buttermilk cream; arugula with apple & cider dressing and pecorino cheese; and buttermilk cottage cheese with okra, biscuit crumbs, garlic, citrus, chilies and parsley. Meanwhile, the pizza menu includes toppings such as apples, red onion, ricotta, buttermilk cheddar, rosemary and sunflower seeds; belly ham, mozzarella, grana Padano, oregano and chilies; mustards, mayo, parmesan, montasio, garlic, lemon, parsley and black pepper; whole trout, grains, orange, almonds, red onion and parsley; and steak, soy rub, cabbage, Vidalia onion, garlic, fish sauce, lemon and parmesan. Many chefs are introduced to the world of cooking at a young age- it is the foundation upon which they build to refine their cooking style and bring it to the masses. Like most chefs, Jose Mendin was introduced to food culture at a young age; unlike most chefs, however, Jose’s mother didn’t let him cook when he was growing up, and he didn’t start until he’d left home. Since so many chefs start their training at a young age, Jose was at something of a disadvantage, but as his place on this list demonstrates, he quickly made up for lost time. After graduating cooking school at Johnson & Wales in 2011, Jose went on to become part of the team that opened Nobu in Miami and London’s Hyde Park. Despite growing up in a house that emphasized Puerto Rican cooking and culture, Jose quickly discovered a skill and affinity for Asian cuisine, and he has successfully blended the two styles at his previous solo efforts PB Steak and L’echon, and now at his main restaurant, Pubbelly. Jose was a semi-finalist for the James Beard Foundation award for “Best Chef: South” from 2011-2015, and he has also received accolades from Food & Wine magazine, Travel + Leisure magazine, Departures magazine and The Cooking Channel. While Jose got his professional start at Nobu, he hasn’t forgotten his Puerto Rican roots, and in the course of his travels around Europe (including in France and Spain, where he cooked for the Prince of Spain) he has expanded his repertoire to incorporate the elements of French and Spanish cooking. L’echon was Jose’s foray into the French brasserie style of cooking, and it received great reviews during its run. At his new effort, Pubbelly, Jose has pulled in all of the culinary elements that have served as inspiration for his cooking over the years, and the result is perhaps the most complete and conceptually daring menu in his career. Offerings at Pubbelly include soft shell chili crab with cilantro, Sichuan oil, red curry and hazelnuts, suckling pig with mojo aioli and chicharron, sweetbreads with hot sauce, pickles and blue cheese, kimchee Bolognese with egg pappardelle, ojingochae and Korean chilies, dates with garlic chorizo, spicy tomato, goat cheese and smoked bacon, and short rib tartare with tobanjan, green mustard, pine nuts and goat toast. French food is as ubiquitous in the culinary world as plates or spoons; you need only look at the bulk of the chefs on this list to see that for yourself. But where many chefs focus only on traditional French cuisine, Justin Devillier has made a name for himself by blending the unique cultures of France and Louisiana to create something entirely new. Born and raised in California, Justin moved to New Orleans in 2003, where he worked in the kitchens of Bacco, Stella and Peristyle; along the way, he picked up the finer points of French cuisine and charcuterie from Chef Anne Kearny-Sands. In 2004, Justin joined the team at La Petite Grocery, and unlike most chefs on this list, he has worked his way up to the top at the same restaurant for the past 12 years. After Hurricane Katrina struck New Orleans, Justin was a vital part of rebuilding La Petite Grocery and making it into the staple of New Orleans dining we know it to be today. In 2007, Justin was named Executive Chef, and in 2008 he was named a “Chef to Watch” by both Louisiana Cookin’ magazine and the Times-Picayune. Justin’s commitment to the revitalization of his hometown has paid off in spades- since its reopening, La Petite Grocery has been considered a New Orleans staple, and it’s due in no small part to the efforts of the native son who helped get it back on its feet. Justin aims to honor both his Louisiana roots and the French traditions from whence they came in his dishes. Offerings such as his steak tartare with quinoa, buttermilk, horseradish & pickled quail egg, griddled octopus with potato salad, pistou & florida bottarga, fried gulf oysters with summer squash, tomatoes, crème fraiche, sweet corn & horseradish, and turtle Bolognese with bucatini, sherry, parsley & fried soft-boiled egg demonstrate a wholly unique approach to balancing the cuisines of two very different regions. It’s no wonder that Zagat noted that Justin makes “clever use of local ingredients in his expertly crafted Contemporary Louisiana-French dinners”- there likely are very few chefs on this list who would even consider using a turtle in their meals, much less making it the focal point of the dish. In a way, Justin’s creations are symbolic of the American Experiment: a mishmash of two (or more) disparate elements, the result of which is often greater than the sum of its parts. Justin’s creative approach to food is a symbol of Louisiana culture: taking what’s available and making something unexpected and delicious. And as long as he’s around, the dining scene in New Orleans is sure to continue to grow. Born in Manila, Philippines and raised in the United States, Paul has tapped into his varied cultural experiences to become one of the more unique chefs on this list. After graduating from Le Cordon Bleu in Austin, TX, Paul began his culinary career working for Tyson Cole, the chef and owner of Uchi and Uchiko restaurants in Austin. After having worked his way up to the role of executive chef and chef de cuisine at Uchiko, Paul opened his eponymous restaurant Qui in Austin in 2012. Qui closed earlier this year, but fans of Paul’s need not worry: he’s planning on opening a new restaurant in the same location called Kuneho next month. Paul’s cooking philosophy is centered around his obsession with creating “the perfect bite.” Whether that means drawing from traditional Philippine dishes as with his sisig (crispy pig’s head with egg yolk custard, cilantro, jalapeñ vinegar and fried egg emulsion), lumpiang sariwa (daikon with carrots and peanuts), wagyu strip loin with nam jim, charred-pickled cauliflower, leeks and thai chili, or his rabbit nam with pickled shallot and crushed peanut, he is willing to try any combination of flavor profiles to reach his goal. Paul has long demonstrated a flair for creating unique dishes that harken back to his Filipino roots, while also incorporating the influences he has picked up in his professional journey. His varied influences give him a broad foundation from which to build his creations, and his keen eye for spotting two disparate flavors that somehow complement one another is unmatched. Though Paul’s dishes could best be described as “global fusion,” to do so would perhaps diminish the artful way in which his creations come to life. As Paul’s own Wikipedia page says, “Paul is an amazing chef.” We’re inclined to agree. According to Michael Schwartz, “the secret to good food is…good food.” Rather than relying on gimmicky variations or esoteric culinary items, Michael’s focus is simply on making the best food possible for his guests. The winner of the James Beard Foundation’s “Best Chef: South” in 2010, Michael may not have received as many formal accolades as other members on this list, but that doesn’t mean that his abilities as a chef are not on par with theirs. It is because Michael focuses simply on making delicious food without the frills that he has had such continued success, both at Michael’s Genuine Food & Drink in Miami and at The Restaurant at The Raleigh in South Beach. While many of today’s chefs are focused more on building a brand name for themselves than on the quality of their creations, Michael’s culinary style runs refreshingly counter to the crowd. More than anything, what is important to Michael is creating dishes that can stand on their own as an experience without any artifice and showmanship. And as his continued success tells us, his method seems to be working. In order to best take advantage of the freshest locally-sourced ingredients in the area, the menu at Michael’s Genuine changes daily. Michael’s culinary style can best be described as “no-frills”- his focus is on letting the ingredients in his dishes speak for themselves, which they often do- loudly. Some of his dishes include crispy pig ears with chile & lime, short rib croquettes with smoked paprika aioli, fennel & celery root salad with mint, arugula, almonds and pecorino, pork belly & fried egg, and a 32-ounce wood oven roasted porterhouse, served with a sour orange-onion marmalade. Over at The Restaurant at The Raleigh, Michael’s creations include crispy Brussels sprouts with bacon and a white balsamic glaze, wild mushroom pappardelle with fresh herbs & truffle butter, panzanella salad with tomato, cucumber, red onion and stracciatella, and short rib empanadas with cantimpalo sausage and tomato aioli. In a world where needless complexity can be mistaken for genius, Michael has carved out a place on this list by focusing on what his guests want: simple, delicious food prepared well and with a sole emphasis on the taste.